Adam Vincenzini presents one analogy and five examples of “social media turn offs”. Turns offs include the blatant sales pitch at the end of a blog post and opportunistic self-promotion – click here for the full list. We love this animated film from Frater celebrating the Year of the Rabbit. Frater (Benji Davies and Jim Field) direct, design and animate for promos, short films, commercials and whatever else comes along. Gung Hay Fat Choi! Can you picture Times Square without billboards? Morgan Spurlock (of Supersize Me fame) and US agency The Barbarian Group have created a site that allows users to remove the advertising from a series of different frames. Once all the frames have been edited, an ad-free version of Times Square will be uploaded to the site…watch this space. Brilliant blog showcasing some of the best that print advertising has to offer. 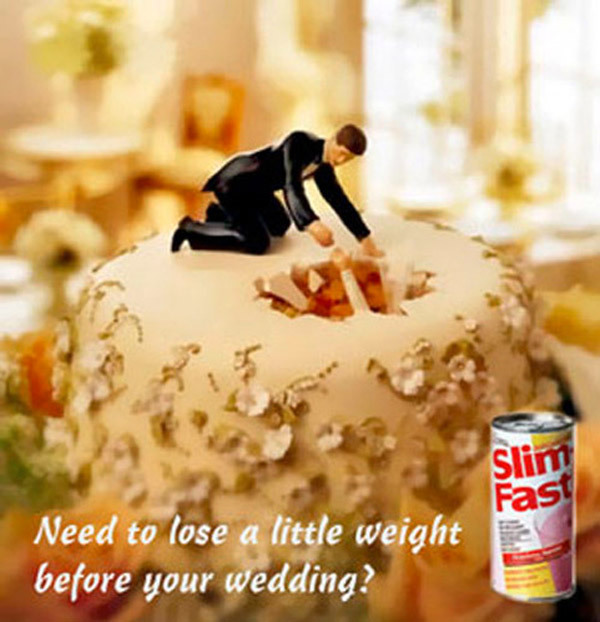 Our favourite is Slim-Fast’s humorous depiction of a bride sinking through a wedding cake, accompanied by the slogan ‘Need to lose a little weight before your wedding?’. We also love Adobo Magazine’s inspirational tale of one of the world’s most famous logos, the Nike tick. Which is your favourite? The latest on the Julian Assange/Wikileaks saga: former friend and collaborator Daniel Domscheit-Berg, a German computer scientist who was a spokesperson for the whistleblowing site until last autumn, has called Assange an “emperor” and alleged that he is obsessed with power and money. Assange has threatened legal action against the former insider, who is soon to launch his own whistleblowing site ‘Open Leaks’.